February 20th, 2018. Posted in: General. Recently Behringer, a very large German music equipment company put out a synthesizer that was an exact, albeit shrunken down version of the much loved Minimoog. A lot has changed in the world of electronics manufacturing in the 48 years since the release of the original synthesizer. 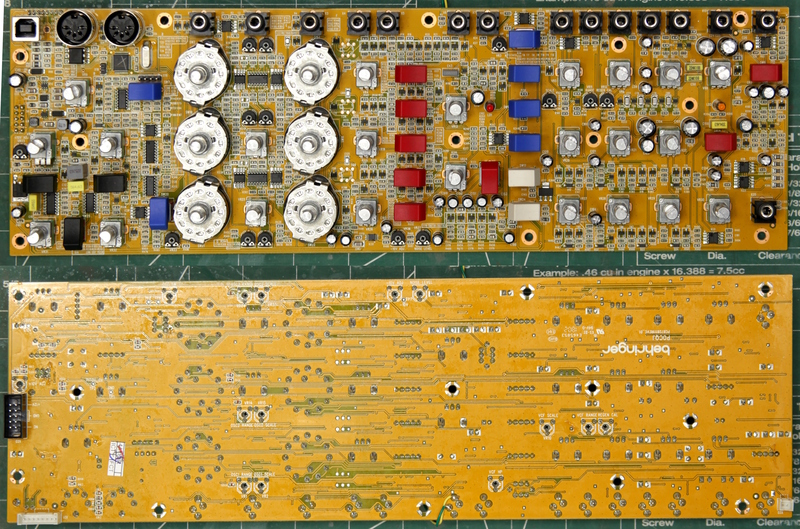 Here are some pictures of the Behringer Model D’s circuit board. Full size (4196 x 2772 JPG 5.7MB) Open in new tab to escape modal window. From something that cost nearly $10,000 (adjusted for inflation) in 1970 to one that was $250 in 2017. Fran’s video showing a circuit board from an Apollo Saturn V launch computer shows the start of the miniaturization process that got us here. While I’ve read a lot of negative comments regarding this company’s decision to release a very affordable version of this vintage synthesizer, I can’t help thinking that Bob Moog himself would be amazed to see the progress that we’ve made in electronics manufacturing and automation. If Dr. Moog designed his synthesizer today, the inside of it would look very similar to this – not sure if he would have made the knobs so small and close though. October 24th, 2016. Posted in: Biking, General. This summer I signed up for the Michigan Championship Points Series, a mountain bike race series that takes place all around the state. It was a really nice opportunity to discover some of the awesome trails and a lot of them were only about 1h drive. After getting beat by almost everyone in the Sport 35-39 category at the first race, a time trial at Yankee Springs I ordered some second-hand books on technique and started practicing at the local garbage dump turned city park. At least out of the sports that I’ve tried, I gotta say that cross country mountain biking is the best sport in the world. If you enjoy riding a bicycle but wish you were surrounded on your rides by trees and fresh air instead of cars and assholes, you might enjoy it too! And as much as I hate to say it, I’ll never get to be a rally driver but flying around trees on a bicycle is a pretty good substitute. If you’re a gear geek, mountain bikes have a lot of adjustable doodads with lots of internet forums dedicated to the adjustment of said doodads. 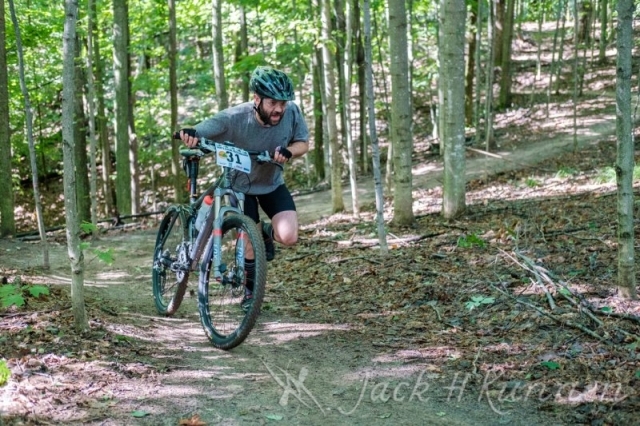 One of the races was up in Bellaire, Michigan and it looked pretty awesome so Mel and I took a few days to go up there. The race was at Glacial Hills and my group was to do 40KM. 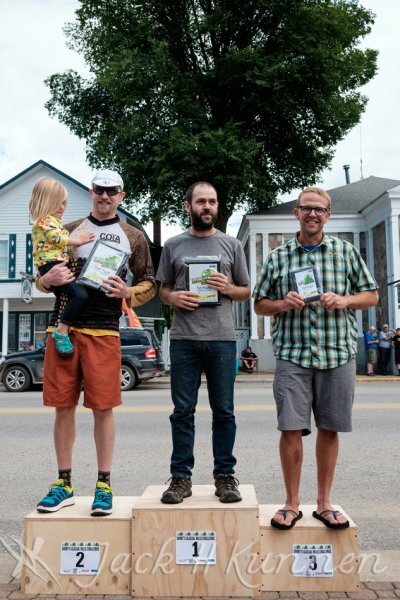 Unlike most races, there were only two other dudes in my category and judging by their calves I expected to come in last. After the first of 3 laps, the guy with the biggest calves started falling behind mainly on the downhills. 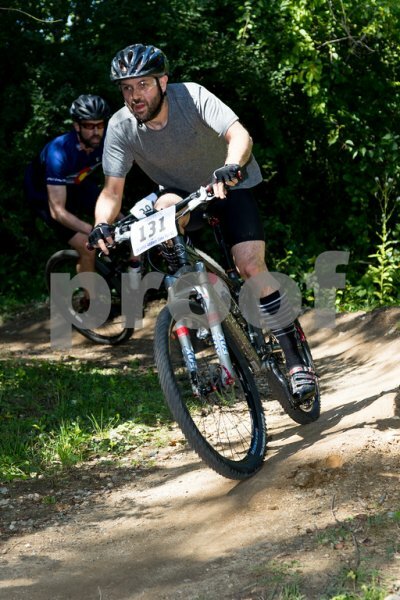 By the end of the second lap, I was starting to notice that the guy in front was slowing on the uphills. I climbed garbage mountain quite a few times leading up to the race and could feel myself being able to climb a bit better. After 10 minutes of internal dialogue and self-doubt, I passed him at the start of the last big climb with about 6 KM to go. I was nervous and took off as fast as I could, wiping out nervously on a slow corner a few minutes later. After about 4KM of watching my odometer and trying to not crash again, the trail turned out onto a long paved road lined with thousands of cheering fans as it headed down into the centre of town. I might have made up the cheering fans part, but that’s how I’m choosing to remember it. October 18th, 2016. Posted in: Building, General. Last month I was asked if I had any ideas for an illuminated art piece to temporarily install in the sculpture garden. I had no ideas, so I declined. A week later I submitted an idea and with the help of Sarah from Windsor’s HackForge, I was able to get some grant money to make it. The design required 100 rear flashing bicycle lights. They were supplied ‘at cost’ by local bike shop City Cyclery and it took almost 3 hours to open each package and install the batteries. My idea was to attach the lights onto the riverfront fence in a sine wave pattern that accurately represented the wave length of a 35 Hz sound. The frequency was chosen because it was the same as the “Mysterious hum that is supposedly originating from Detroit’s Zug Island” (More Info). I installed the sculpture during record rainfall that flooded the city. Unfortunately I didn’t have time to prepare a spreadsheet that would outline each light’s location on the fence, so I had to use a tape measure and calculator. I got pretty fast at using the SIN() button, but the installation did take over 3 hours. Now that the sculpture has been taken down and an art grant paid for 100 bicycle lights, we will be donating all of the lights to places that can properly distribute these lights to cyclists who need them. I’m sure it’s not just a Windsor problem, but there are a lot of folks on bicycles at night that have no lights. Having recently started driving, I found it very startling the first time I came across a bicyclist on the road at night without lights. Hopefully these lights find their way onto the seatposts of some of these bicycles. July 17th, 2016. Posted in: General, The Cross Canada Project. A few weeks ago, a guy named Jay stopped by our construction site of a house to talk. We talked mostly about biking across Canada and you can listen to the conversation as part of Jay’s podcast, Not So Boring Conversations.